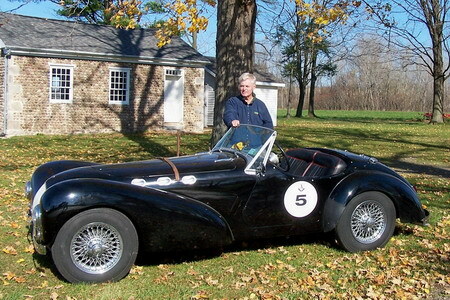 9-30-14 UPDATE: Otto has listed the car with RM and it will be offered at RM's Hershey, PA auction on October 10. The car is listed as Lot #263 with an estimate of $80-100k. Click here to learn more about the car. Otto Meijer has decided it’s time to part with his beloved K2. Otto acquired the car from Canada in 1985, which was in need of more than a little TLC. He restored the car over the next few years, to the condition you see it in today. The car is equipped with a Ford 302 V8 engine (1968) and a Ford 3-speed transmission (many Allards inherited “modern” engines when their original power plant expired). The wheels were converted (properly) from discs to 72-spoke wire wheels and are wrapped in 16 x 6.00 rubber. The hood was replaced without the special bubble and the car was repainted black. When Otto acquired the car, there were signs of a previous fire in the bulkhead area, which claimed the number plate. 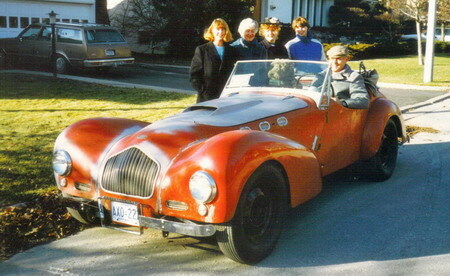 Otto, along with the Allard Register have searched extensively to find the original chassis number, but unfortunately the original chassis number remains unknown. The Register has assigned it a temporary chassis number of K2-6015. It’s believed the original paint color was red, but that can’t be confirmed. One tip that may help, the windshield side curtain has a yellow Hawaii registration sticker from 1962. To learn more about this K2, please click here to read a piece we published about the car and its unique history.